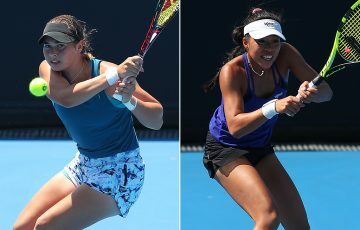 Day two of the Optus 14s Teams Championships was forecast to be a Melbourne scorcher; the blistering summer heat was such that it could already be felt as early as mid morning and it quite understandably proved to be a challenging day for the young tennis players to withstand. 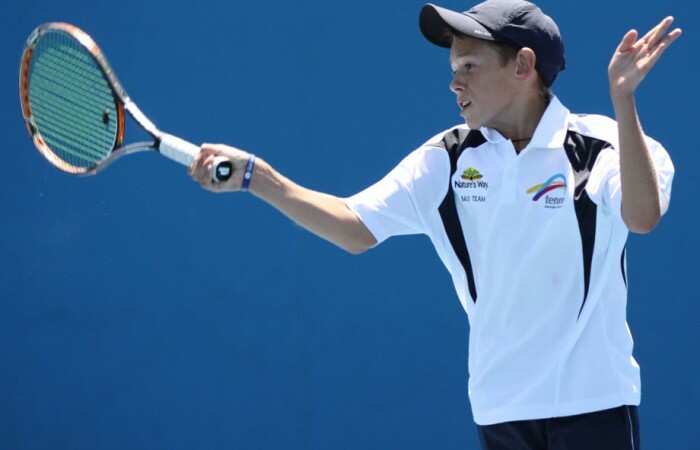 The boys 14/U competition saw the New South Wales, Queensland and Australian Capital Territory teams securing victories for the singles matches over Western Australia, New Zealand and Tasmania respectively. New South Wales’ Alex DeMinaur started the day on court 5 against Western Australian player Scott Jones; a match that showcased a display of numerous exciting angled shots down the far corners of the court from both players, however, DeMinaur’s reasonably consistent baseline points saw him get up 6-2 4-6 6-4. Benard Nkomba seized success once again for NSW winning his singles match against Ben Webster rather impressively in straight sets 6-0 6-0. 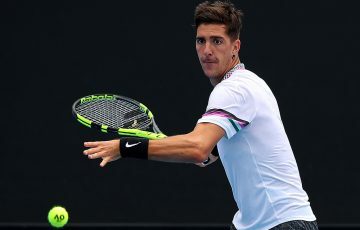 Queensland disposed of New Zealand with the combination of Nathanael Consalvo’s 6-4 2-6 6-2 triumph despite some resistance from Miki Nobuzaw in the second set and Jack Walton’s 6-4 6-2 win. The ACT/NSW boys 14/U players Alex DeJong and Dimitri Morogiannis clinched both of their singles matches in straight sets 6-2 6-3 and 6-2 6-1 over Tasmania respectively. 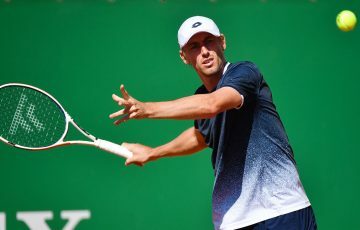 Victoria B’s Jaime Sekulovski and South Australia’s Mislav Bosnjak displayed some absolutely terrific tennis in their singles marathon of a match lasting over three hours, both boys enduring the scorching heat through three lengthy sets; the second going to a tiebreak. In the end it was Sekulovski who came out on top with a commendable win of 5-7 7-6(2) 7-5. Likewise, Victoria B’s Stefan Skadarka finished on top with a score of 4-6 6-4 6-1. The singles match scores for the girls 14/U competition presented similarly consistent results. The West Australian, South Australian, New Zealand and Victorian teams claimed their singles matches for the day over New South Wales, ACT/NSW, Tasmania and Queensland respectively. 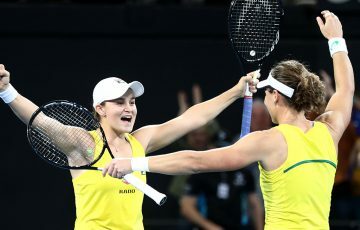 Western Australia’s Maddison Inglis displayed some powerful groundstrokes, mixing up her play with a number of baseline volleys, at times bouncing too high for her opponent to return, providing some exciting tennis for those watching from the sidelines. 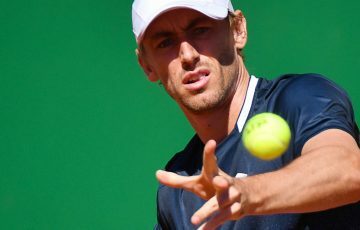 South Australia overcame ACT/NSW with 7-5 6-3 and 6-4 6-1 wins, while New Zealand also claimed singles victories for the day over Tasmania 6-3 6-2 and 6-2 6-0. Victoria and Queensland girls 14/U took their singles matches to three sets, turning the score in their favour 1-6 7-6 3-6 and 4-6 6-2 3-6. 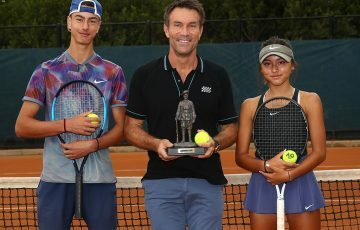 The boys doubles saw success for the ACT/NSW boys Alex DeJong and Patrick Wielemborek, NSW boys Kody Pearson and Benard Nkomba and New Zealand girls Ashleigh Harvey and Lana Popovich; each triumphing in straight sets. The sweltering heat appeared to begin to take its toll on some of the young athletes throughout the course of the day, however, admirably, they maintained reasonably high energy levels and continued to keep themselves motivated. Words of encouragement and praise could be heard from the team managers at the sidelines as the players appeared to grow more frustrated with the weather conditions that were progressively wearing the athletes down physically and mentally. Queensland girls 14/U Team Manager Gareth Keating, like many of the coaches, stressed the importance of strategy in such wearing weather conditions. New Zealand Boys 14/U Team Manager Clint Packer explained that his boys were not as experienced as the Australian players in dealing with the heat. It therefore did not come as too much of a surprise that the heat rule came into play at around 2:20 pm. View Boys 14/U match scores here. View Girls 14/U match scores here.